As a tourist guide, I often organize tours for visitors who want to see the beauty of Raja Ampat, both its above the water landscape and underwater marine life. The duration of the tour can be as short as 3 days/ 2 nights to 7 days/ 6 nights or more with such activities as snorkeling and island hopping trip as well as hiking, birding and wildlife watching tour. The following trip plan should be considered as reference only. It can be modified according to the needs of the visitors. Day 1. Arriving in Sorong city, transfer by ferry to Waigeo and then by car to guesthouse. You could enjoy swimming and snorkeling at the beach in front of the guesthouse. Make sure that you do not step on the corals that are very fragile. Day 2. Birding in the south of Waigeo. There are a lot of species of birds that live in the forest and coastal area of Waigeo island such as Sulphur-crested Cockatoo, Pinon Imperial Pigeon, Palm Cockatoo, Eclectus Parrot, Great-billed Parrot, Red-cheeked Parrot, Pied Imperial Pigeon, Pinon Imperial Pigeon, Yellow-faced Myna, Sacred Kingfisher, Beach Kingfisher, Dusky Scrubfowl, Eastern Osprey, Brahminy Kite, and White-bellied Sea Eagle, Radjah Shelduck, and etc. To enhance birding experience, we will provide a spotting scope but we encourage every visitor to bring at least a good pair of 10×42 binoculars. Day 3. Sightseeing and birding tour to karst islets in Kabui bay. For snorkeling, visitors need to bring their own mask, snorkel, and swimfins. A good underwater camera such as Gopro or Nikon W300 is also recommended. Every birdwatcher usually brings a pair of binoculars and a bridge camera with telephoto lens such as Nikon P1000 or Canon SX60HS to take pictures of birds. Wildlife photographers, in general bring a D-SLR camera with telephoto lens such as Sigma 150-600 mm sport. 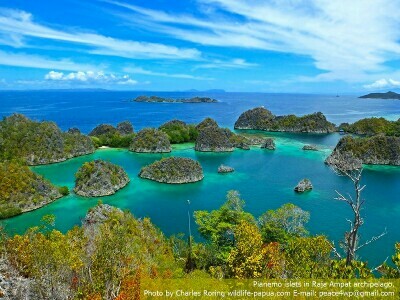 Raja Ampat is famous for its beautiful islands and marine life. 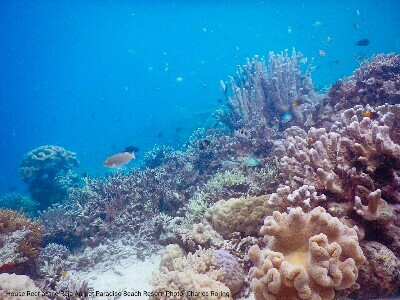 So, it is natural if visitors go there to enjoy sightseeing and snorkeling tour. There are a lot of snorkeling sites. Some of them include: Yenbuba strait, some karst islets in Kabui bay, Friwen Wall, Five Rocks, Western areas of Mansuar island, Arborek, and Gam island. Usually, I choose a beach resort which functions as a base during the tours. For instance, Raja Ampat Paradise Resort at Warduwer beach of Waigeo island. Every morning, snorkeling and sightseeing tour can be organized from the resort to islands or beaches that I mention above. For rainforest birding tour in Raja Ampat, Waigeo is a very good destination. It is a big island with a lot of birdlife. 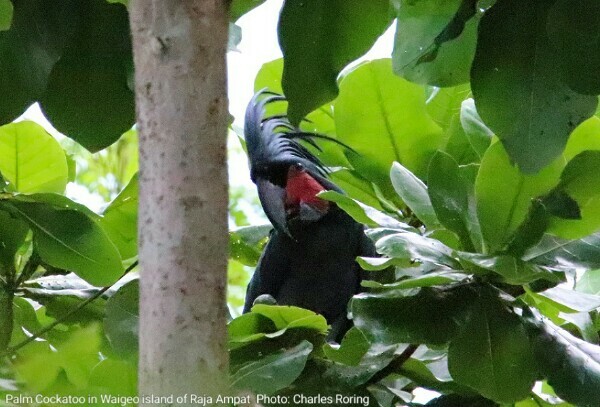 Visitors who go birding in Waigeo will get the chance to watch Willie Wagtail, Mimic Meliphaga, Puff-backed Meliphaga, Sacred Kingfisher, Collared Kingfisher, Beach Kingfisher, Radjah Shelduck, Palm Cockatoo, Eclectus Parrot, Sulphur-crested Cockatoo, Red-cheeked Parrot, Yellow-faced Myna, White-bellied Sea Eagle, Brahminy Kite, Eastern Osprey, Pink-spotted Fruit Dove, Pied Imperial Pigeon, Pinon Imperial Pigeon, Red Bird of Paradise, and Wilson's Bird of Paradise, Torresian Crow, and a lot more. For customized trips and costs, please, contact us by email to: peace4wp@gmail.com or by whatsapp to +6281332245180.